Hot on the heels of last week's USB 3.2 news - where the USB-IF tried to simplify consumer choices as we go forward - there is news today on another new USB standard, USB4. Intel revealed the next-gen spec at an event in Taipei earlier today. 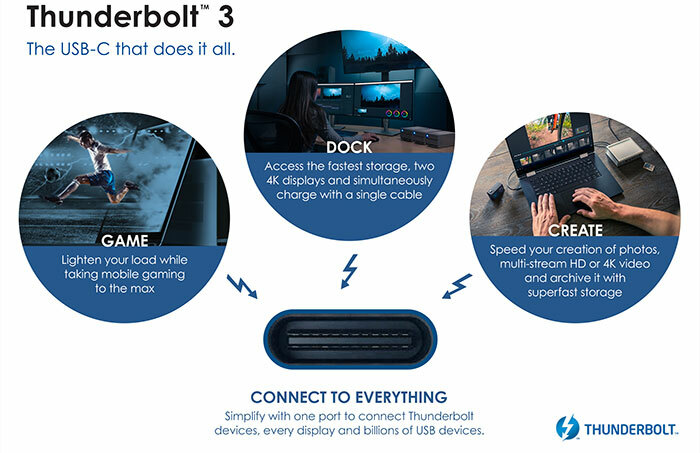 In brief, Intel is open licensing its Thunderbolt 3 technology, so third parties can use it royalty free, and the USB-IF is integrating this tech which will then become USB4. Thus, USB4 will offer up to 40Gbps speeds, double the speed of the USB 3.2 Gen 2x2 standard (AKA SuperSpeed USB 20Gbps). The USB Interface Group's press release about the USB4 specification (yes this standard drops the space between the string 'USB' and the generational numeral) says it will be a major update to the specification. It defines a "method to share a single high-speed link with multiple end device types dynamically that best serves the transfer of data by type and application," dryly explains the organisation. One of the great benefits of basically adopting the Thunderbolt 3 standard as USB4 are that there are already lots of Thunderbolt devices available, over 450. In 2019 Thunderbolt 3 displays, networking products, docks, eGFX, PCI expansion, storage devices, and other adaptors are all numerous. Furthermore, USB4 sets 40Gbps as the new baseline. The USB4 spec isn't actually finalised as yet but it shouldn't wander too far off Thunderbolt 3 or else it would lose many attractions, as mentioned above. Another appealing facet is that Intel intends to integrate Thunderbolt 3 into upcoming 10nm processors, code-named 'Ice Lake' and beyond. As well as the growing number of devices available this should spur on large scale mainstream adoption. 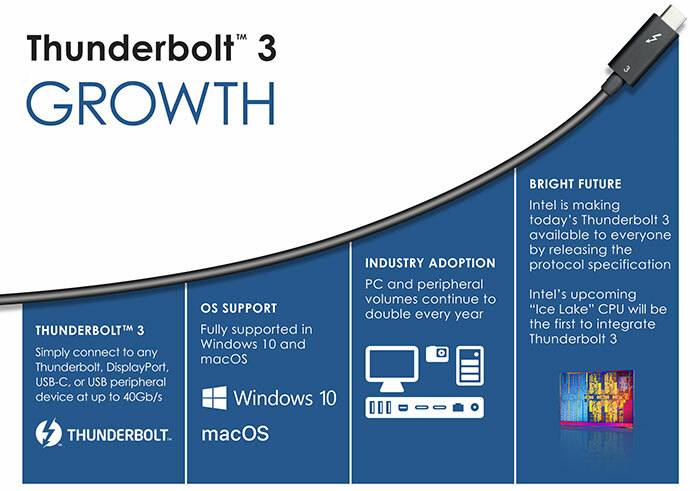 Thunderbolt 3 is already well supported in various OSes like Windows 10, MacOS and Linux. 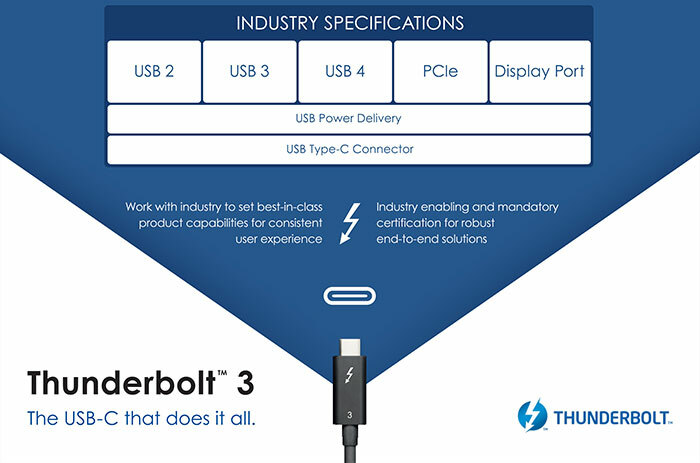 Intel will continue to design and certify hardware for Thunderbolt 3 but third parties won't need Intel certification to release their gadgets with USB4 branding. Existing Thunderbolt 3 cables should be fine to continue to use with USB4 but if you have a USB 3.x cable with Type-C connectors, you may have to upgrade to make the most of the new options available. It is expected that the USB-IF will come out with more tech specs regarding USB4 at around Computex time. Over 50 companies are working on the current draft spec and products, and we might get announcements of the first related products around that time too. Windows 10 updated to enable USB 'Quick Removal' default Asus UK launches the RoG Strix Scope gaming keyboard Intel Core i5-9400 PC Specialist Vortex S1 Has Samsung been chosen for Intel Xe GPU manufacturing? I'm a bit (more) confused. So what's the actual difference between a Thunderbolt 3 with type C port and “USB4” with type C? Intel certification? Reading the article, I think that's it. One has Intel certification, the other doesn't. ill be dead by the time this gets released… too many years to rolls these specs out, then product that supports it. But as it’s built on the Thundeebolt 3 spec, there are already Thunderbolt devices that it will support. And - hopefully - a few companies will take their Thunderbolt 3 devices, rebrand them to USB4 and pass the licensing savings on to the consumer!